What was Greece’s geography like? How did geography affect Ancient Greek civilization? Here’s a mystery box that will help us answer these questions. The contents of this box shaped Greek culture. It holds secret weapons that helped Greece defeat the almost unstoppable Persian Empire. The items in this box also helped lead to the fall of Ancient Greece. Curious? Okay, go ahead and take a peek. Naturally, the Greeks depended a lot on the sea for food. However, about 1/3 of the land in Greece was fertile enough to grow grains. Barley was the Greek staple crop. They also grew herbs such as mint and oregano, fruits like grapes, apples, and pears, and vegetables such as onions, garlic, and chick peas. They raised goats and sheep for meat, wool, and milk. Okay, that’s great, but was this really enough to power one of the greatest civilizations of all time? Well, yes and no. 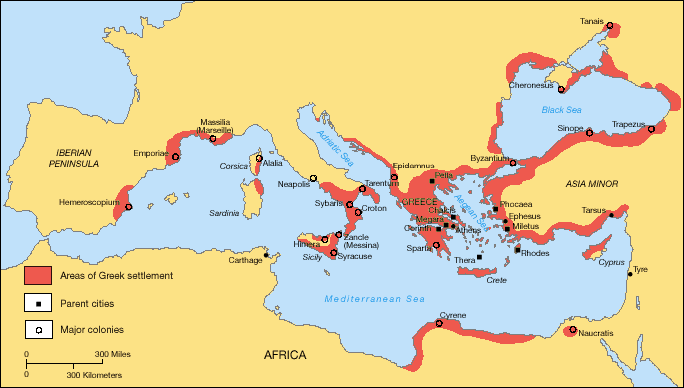 With so little fertile land, the Greeks had to import grains from other civilizations in the Eastern Mediterranean. Fortunately, because most Greeks grew up near the ocean, they were great sailors. The Ancient Greeks came to dominate sea trade in the region. They traded wood, olive oil - olive trees happen to love rocky soil – and other products in order to get the resources they needed. They also established colonies throughout the Mediterranean, wherever they could find a piece of available fertile land. Fertile land was as good as gold. Meanwhile, back in Greece, the Greek city-states were isolated from each other by the mountains, forests, and the sea. Many city-states shared a religion, language, and other customs, but they were also fiercely independent. There was no real sense that “we’re all Greeks and we should work together.” The city-states did their own thing. They fought each other a lot, often over farmland, and they only really came together for the Olympics and when they had to defeat the Persian invasion in the 400s BCE. Geography caused the Greeks to fight each other, but it also played a huge part in their win over the Persians. Any outsider that wanted to invade Greece was in for a surprise. In those times, armies usually had to live off the land while they were away from home. As we’ve discussed, there was not much to live off of in Greece. Even if an invading army like the Persians had a sophisticated supply system for the army, it would be hard to move it across the rugged terrain of Greece. Still, the Persians outnumbered the Greeks by 4 to 1 or more. Ah, yes, but geography was on the Greek’s side. The Persians were used to fighting on wide open plains with cavalry and light, quick troops. These tactics did not work very well in Greece’s tight spaces and mountainous terrain. The Greeks, very used to fighting each other in Greece, had heavily armored troops that were well trained slug it out in close fighting. Don’t forget that the Greeks were great sailors too. The Persians just sailed because they had to in order to get to Greece. Using this “home field advantage” provided by their own geography, the Greeks were able to defeat the Persian Empire. After the Persian Wars, the Greeks went back to living as they had before. They went back to each city-state doing its own thing and fighting each other. Ultimately, the Peloponnesian Wars were fought between the Greek city-states, with Athens leading one side and Sparta leading the other. Athens lost, and it and the rest of Greece were never the same again. Weakened by decades of civil war, Greece eventually fell to Alexander the Great and his father, Phillip II, in the 300s BCE. The geography of Greece shaped its culture. It gave the Greeks much of what they needed to thrive. It motivated trade and colonization so they could get what they didn’t have enough of at home. Geography helped the Greeks triumph over the mighty Persians. And yet, it also kept them from becoming unified. What could Greece have become? We will never know. We do know, using the Greeks and many other examples from ancient history, that geography has a huge influence on how things turn out. Now, put everything back in the mystery box. Give it to someone else and tell them how some rocks, dirt, salt water, and trees helped shape the civilization of the Ancient Greeks.